Nordic prime ministers are poking fun at a photo of President Donald Trump and Saudi Arabian King Salman holding a glowing orb that went immediately viral last week, reenacting the image with a soccer ball. The initial meme-worthy photo of the president and King Salman clasping a glowing orb emerged during his trip to Riyadh to attend the opening event for the new Global Centre for Combating Extremist Ideology. 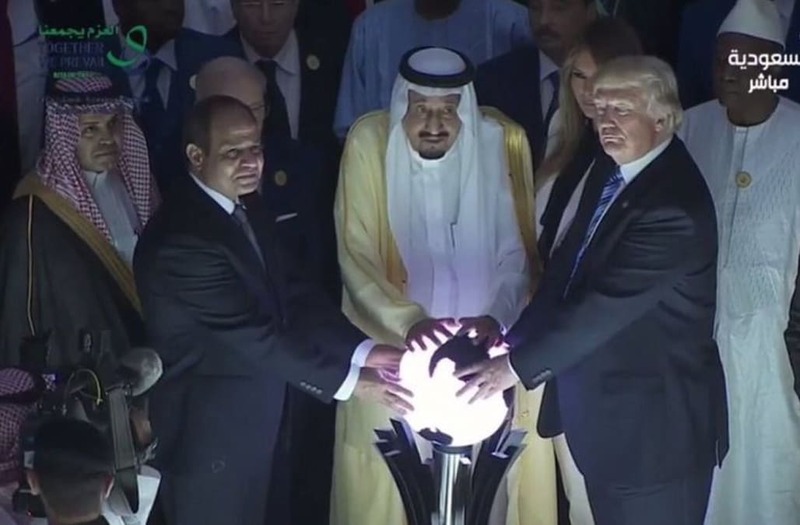 While there, Trump, King Salman and Egyptian President Abdel Fattah el-Sisi placed their hands on an illuminated globe the size of a kickball for the opening ceremony. The startling photograph, which prompted comparisons between Trump and comic book villains, quickly garnered attention and was apparently found just as amusing by the prime ministers of Norway, Finland, Sweden, Denmark and Iceland, as it was by the internet. According to the Nordic leaders, the glowing orb "loses power and is somewhat less threatening on these latitudes." Though the five leaders were holding a soccer ball instead of an orb, the comparisons bewteen the two images did not go unnoticed by Twitter. @astroehlein Erm are they making a reference to a certain other globe-based photo?